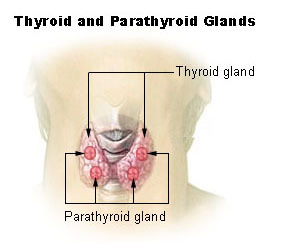 The thyroid gland is an endocrine gland. 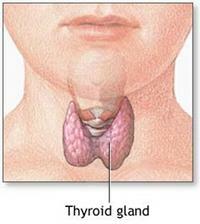 The thyroid is found in the neck, below the thyroid cartilage which forms the "Adam's apple". It is made of 2 lobes, one on either side of the windpipe. The thyroid controls growth and how quickly the body uses energy. It does this by secreting hormones, the main ones which are Triiodothyronine T3, Tetraiodothyronine T4 and Thyroxine. These hormones regulate the metabolism and affect the growth and function of many other systems in the body. Hormonal output from the thyroid is regulated by thyroid-stimulating hormone (TSH) produced by the anterior pituitary, which itself is regulated bythyrotropin-releasing hormone (TRH) produced by the hypothalamus. The thyroid gets its name from the Greek word for shield, due to it's shape. The most common problems of the thyroid are an overactive thyroid gland, (hyperthyroidism), and an underactive thyroid gland, (hypothyroidism). The thyroid is found in the neck, below the thyroid cartilage which forms the "Adam's apple". It is made of 2 lobes, one on either side of the windpipe.